The health of your back depends on the support of your abdominals—but not the ones you think! Did you know that the abdominal muscles are designed to protect the lumbar spine against disk problems? 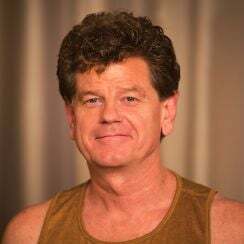 It’s a paradox then, that in our ab-obsessed culture, so many of us suffer from low back pain—and in particular, disk herniation among the lowest vertebrae. You might think that toning your abs would lead to fewer back problems, but unfortunately, that is often not the case. Sit-ups and related exercises strengthen only one set of abdominal muscles, the rectus abdominis, which have little to do with the health of your spine. Although most yoga postures don’t emphasize exercising the abdominals exclusively, a number of asanas work the full set of your abdominals to stabilize and support your lumbar spine, thus preventing disk problems and other forms of lower back pain. A simple anatomy lesson might be helpful here. The spinal column is made up of 33 vertebrae, including 5 that fuse to form the sacrum, and 4 that form the tailbone. The remaining 24 vertebrae are grouped in three regions: the 7 cervical vertebrae (C1– C7), which begin at the base of the skull; the 12 thoracic vertebrae (T1–T12), to which the ribs attach; and the 5 lumbar vertebrae (L1–L5), in the small of the back, just above the sacrum (S1–S5). Each vertebra is cushioned by a disk that absorbs shock and keeps the spine limber. When the spine is asked to bear not only the weight of the body but also anything heavy that you’re carrying while you bend and twist with this load, you can imagine why these disks get injured. The most serious injury to the disk is herniation—a painful condition in which the gel-like inner core of the disk is squeezed out as the disk ruptures, putting direct pressure on crucial nerves as they exit the spinal cord. The abdominals are a significant line of defense against wear on the lumbar disks. They offer protection by limiting excessive rotation of the lumbar spine and by controlling the tilt of the pelvis and, thus, the curve of the spine. Each of the three regions of the spine is defined by its distinctive curve: the lumbar spine curves inward, while the thoracic spine curves outward—and then the cervical spine curves inward once again. The points of transition between these curves of the spine are the most vulnerable to injury because they are the points of greatest movement. The juncture between the sacrum and the lumbar spine presents a special problem, because more rotation is possible at this point than any other in the lumbar spine. Our postural habits can contribute to this problem. Take a moment to observe your own way of sitting. Do you sit at the front edge of your desk chair and arch your back? Or do you slump back in your chair without supporting your lower back? Do you place more weight on one hip than on the other, or even tip to one side and fold the other leg under you? Each of these habits puts acute, asymmetrical pressure on your spinal disks—especially at L5—squeezing them hard. When you also consider how often you turn to answer the phone at your desk or twist to do some other chore (adding that rotational pressure to the spine) it’s not surprising that your postural habits can contribute to injury in the lumbar spine. The abdominals are one of your only significant lines of defense against wear on the lumbar disks. They offer protection in two ways: by limiting excessive rotation of the lumbar spine and by controlling the tilt of the pelvis and, thus, the curve of the spine. But before you hit the mat and start doing crunches, read on. The abdominals are comprised of four paired muscles: rectus abdominis, the internal obliques, the external obliques, and the transversus abdominis. The strap-like pair of muscles often admired in the form of a “six pack” is your rectus abdominis. Most of the popular ab exercises—curls, crunches, and sit-ups—target the rectus abdominis, but the rectus abdominis does little to support and stabilize the spine. When overdeveloped, this pair of muscles pulls down on the rib cage, rounding the upper back and creating tension in the shoulders, upper back, and neck. This imbalance can compromise the action of the other abdominal muscles—the ones we need in order to maintain a healthy back. The most important abdominal muscles for postural integrity are the obliques. Believe it or not, the most important abdominal muscles for postural integrity are the obliques. The external obliques, which provide the most protection against the stressful rotation of the lumbar spine, are located on either side of the rectus abdominis. They attach to the seven lower ribs and to the hip bones. When you move your ribs in one direction and your pelvis in the opposite direction, the external obliques limit how much the lumbar spine twists. They also help control the pelvic tilt. By tilting the pelvis back (posteriorly), they can reverse an overly arched lower back. Beneath the external obliques lie the internal obliques, which run from the lower ribs down toward the inside of the hip bones. When contracted, they firm the lower belly and draw the lower ribs toward the pit of the abdomen, below the navel, as the spine bends forward. These muscles don’t affect the pelvic tilt in the way that the external obliques do, but they provide support to the sacrum; they also work in conjunction with the external obliques in twisting actions. The transversus abdominis is the deepest muscle, running horizontally around the waist. Like a girdle, it pulls in on the belly and waist on all sides, providing overall support. The transversus abdominis is activated when you pull your navel back toward the spine or when you cough. How, then, do you strengthen these muscles—and the external obliques in particular? It’s not by doing sit-ups or even curls, which work the rectus abdominis far more than the obliques and tighten the hip flexors. Because the external obliques prevent the pelvis from tilting forward, the best way to work them is through leg movements that challenge their ability to control the pelvic tilt. For example, if you lie on your back with your legs perpendicular to the floor, contract the abdominals to ground the pelvis and then begin to lower your legs (while keeping them straight), your abdominals will have to work very hard to prevent the pelvis from tipping forward. Most of the popular ab exercises–curls, crunches, and sit-ups–target the rectus abdominis, but the rectus abdominis does little to support and stabilize the spine. A similar challenge is involved in ardha navasana (half boat pose). But because so many of us are weak in the obliques—even when our other abdominal muscles are strong—it’s best to approach these exercises progressively. If you do too much too soon, the hip flexors, which tend to be stronger and tighter than the relatively underused abdominals, may pull on the lumbar spine and pelvis, increase the arch in your lower back, and thus exert a shearing force on the spine. Keeping your lower back flat on the floor during these exercises will be the key to protecting your spine against the pull of the hip flexors on an overly arched back. The resulting tone in the lower abdominals will then protect your lower back in your daily life as well. Start by lying on your back, with your knees bent and both feet on the floor, hip distance apart. Your thighs should be at a 45-degree angle to the floor. Press your lower back into the floor by firming your lower belly below the navel. Place your fingers on your lower abdomen to make sure that your abdominal muscles (and not the muscles at the front of your hips) are doing the work. (Here’s a hint: if you’re tightening your hip flexors instead of your abs your neck will tighten as well). Extend your right leg at about 45 degrees from the floor, keeping the big toe and kneecap pointing straight up toward the ceiling. Lower your right leg only as far as you can while keeping your lower abdomen firm and your lower back pressed into the floor. The weight of your leg will pull at your pelvis; use your external obliques to resist that pull. Work back and forth, alternating legs. Be sure not to take your leg down so far that you begin to lose the firmness in the abdomen or allow your lower back to arch. If that was easy, try lying on your back with your thighs perpendicular to the floor. Bend your knees to 90 degrees, as if your feet were resting on a chair. Firm your lower belly again, pressing your lower back to the floor; press the backs of your ribs down as well. Extend your right leg out at 45 degrees and lower it, keeping the lower back and middle ribs grounded. Alternate legs. For a full expression of ardha navasana, extend both legs straight up toward the ceiling. First, alternate lowering the legs one at a time as in the previous exercises. If that feels okay, come into the full pose: lower both legs to about 30 degrees from the floor, with your big toe mounds touching, your inner heels apart, and your inner thighs firm. Extend your arms forward and then curl your upper body up, keeping your sacrum and mid-back pressed into the floor from the firmness of your abdominals. Bend your knees, release your upper body to the floor, and bring your legs back to vertical. After two to three repetitions, hug your knees into your chest. To maintain healthy, balanced muscle tone on all sides of the spine, you will also need to strengthen the paraspinal muscles of the lower back, which support the inward arch of the lumbar spine, and to stretch the hip flexors, especially the psoas. It’s important to keep these muscles strong and supple, balancing their strength with the strength of the abdominals. If you overdo the abdominal exercises described here and don’t balance them with lower back strengtheners, you may end up creating too much of a backward tilt in your everyday posture, flattening your lumbar curve. Toning the lower abdominals in your yoga practice will protect your lower back in your daily life as well. Attaining this balance in your practice is quite simple. Ardha navasana (half boat pose) works the obliques directly while countering the pull of the hip flexors. Paripurna navasana (full boat pose) does the opposite: it strengthens the paraspinal muscles of the lower back as well as the hip flexors, particularly the quadriceps and psoas, while the abdominals work only moderately. Paripurna navasana is often thought to be an abdominal pose, but only because it is so often done with the spine misaligned. If your lower back is weak, you will roll back toward your tailbone, your abdominals will grip to hold you up, and your thighs and hips may grip and cramp as well. But when you execute the pose correctly, your back is straight, or even slightly arched. Your lower back muscles work strongly, while the hip flexors can release some of their gripping action in the hips. To start, sit with both knees bent and your feet on the floor. Hold your thighs with your hands so that your fingertips are behind the knees. Lean back to straighten your spine, bringing a small arch into your lower back. Keep your head slightly forward. As you rock back on the back edges of your sit bones—but not so far that you come onto your tailbone—your feet will rise a few inches off the ground. Keep your spine straight and steady. Lift your feet until your shins are parallel to the floor. Pull with your hands against your thighs to keep your spine straight and your hip joints relatively relaxed. Use your hands to spiral your thighs inward so that they remain parallel, with the inner edges of your thighs firm: the support of these adductors will help your lower back. If your lower back feels strong (i.e., you’re not rocking back onto your tailbone), your chest is lifted and open, and your shoulders are back, then press your thighs into your hands and start to straighten your legs using the strength of your quadriceps. Don’t allow your knees to turn out; by spiraling your thighs inward, you will maintain the strength of your lower back. To complete the pose, extend your arms forward, parallel to both each other and to the floor. Draw your shoulders straight back again to keep your chest open and lifted. The main work should be in your lower back and thighs, with some toning throughout the abdominals. In the full pose, your hip flexors (at your hip creases) will be working as well, but if they begin to grip and cramp, it’s because your lower back and quadriceps are weakening and your pelvis is tipping back. In that case, hold your thighs with your hands to keep your lower back strong. Abdominal exercises inevitably involve some tightening of the psoas, so if you fail to release the psoas after this work, you may end up with a stiff, sore lower back. Do a mild variation of eka pada rajakapotasana (king pigeon pose) to release the psoas and other hip flexors. Start with one knee bent and the sole of the foot near the opposite groin. Extend the entire length of the other leg behind you straight on the floor. 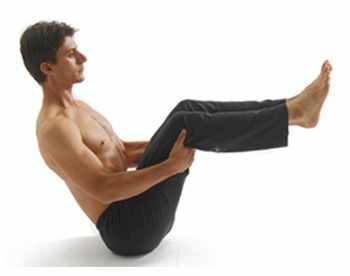 Reach back through the toes of the back leg, gently pressing the top of your foot into the floor to activate the thigh. Now lift up through your lower belly to get a stretch and release deep inside the pelvis, where the psoas lies. Repeat the pose on the other side. Abdominal support is especially important in twisting poses where it stabilizes the otherwise vulnerable lumbar spine. 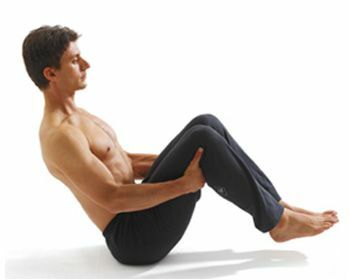 To come into a simple seated twist, initiate the twist from the external obliques on your left side. Simultaneously, activate the internal obliques on your right side. This will keep your lower belly firm and lifting. Keep a neutral arch in your lower back, not tipping your pelvis back; and keep the left sit bone grounded. As you maintain an inward arch of your lower back, turn your hips slightly in the direction opposite to the twist to keep your foundation stable. With support from the obliques, the twist comes more from the middle and upper back, and less from the lumbar spine. The deepest part of the twist comes from a gentle lift just above the pelvic floor. As you’ll see, it is possible to turn from the pit of your abdomen from the action of your obliques, while keeping your hips and lower back stable, giving a gentle, healthy squeeze to your inner organs. Repeat this entire process on the other side. This approach to twisting, which honors the protective role that the abdominals play for the lumbar spine, makes the pose safe, as well as energizing. Your lumbar disks will thank you for it.